[154 Pages Report] The global data center power market is estimated to grow from USD 13.54 billion in 2016 to USD 21.73 billion by 2021, at a Compound Annual Growth Rate (CAGR) of 9.92% during the forecast period. Factor such as the growing concern of data center providers to optimize operational cost of the data center by reducing the cost of the data center power is driving the growth of the global data center market. The base year considered for this study is 2015 and the forecast period considered is 2016–2021. Most of the data centers consume power through UPS systems. The UPS power supply system consumes huge space and requires regular maintenance to function. For example, the UPS cabinets and rows of the batteries require large areas, which consumes more power. In addition, the data center using a UPS power supply system can face unplanned power outage problems, which leads to its non-functioning. The unplanned power outages are caused by the UPS failure due to rackspace problem, which would lead several servers to go offline. For example, in 2015, Telecity, a European data center provider, faced two power outages in London due to UPS failure, due to which the data center owner incurred huge losses. The data center outage problem disrupts businesses, reduces revenue, and decreases end users’ productivity. Thus, the modern data center power providers are offering modular and standardized data center power to the end users, which do not have power outage problems. 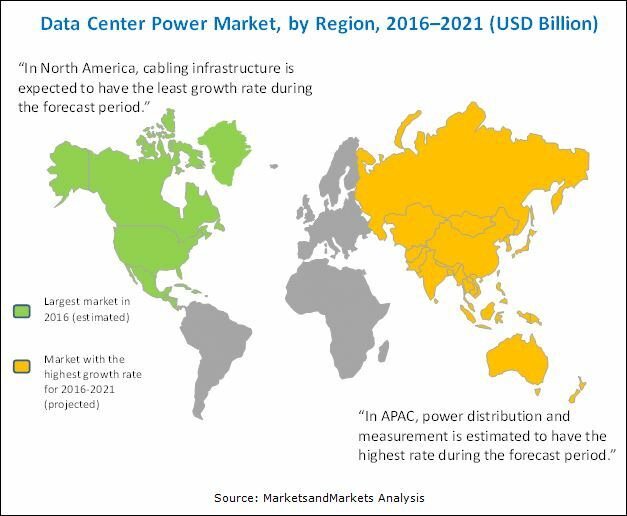 The data center power market ecosystem comprises ABB (Zurich, Switzerland), Emerson Electric Company (Missouri, U.S.), Schneider Electric (Rueil-Malmaison Cedex, France), General Electric (New York, U.S.), Eaton (Dublin, Republic of Ireland), Delta Power Solutions (Taipei, Taiwan), Raritan Inc. (New Jersey, U.S.), Rittal GmbH & Co. KG (Illinois, U.S.), Server Technology, Inc. (Nevada, U.S.), Tripp Lite (Illinois, U.S.), CyberPower System (Taipei, Taiwan), Black Box Corporation (Pennsylvania, U.S.), Caterpillar Inc. (California, U.S.), and HP Enterprise Company (California, U.S.). These players have adopted various strategies, such as partnerships, agreements, and collaborations; mergers & acquisitions; and new product developments to achieve growth in the global market. Other stakeholders of the data center power market include cloud vendors, systems integrators, application designers & development service providers, and network service providers.